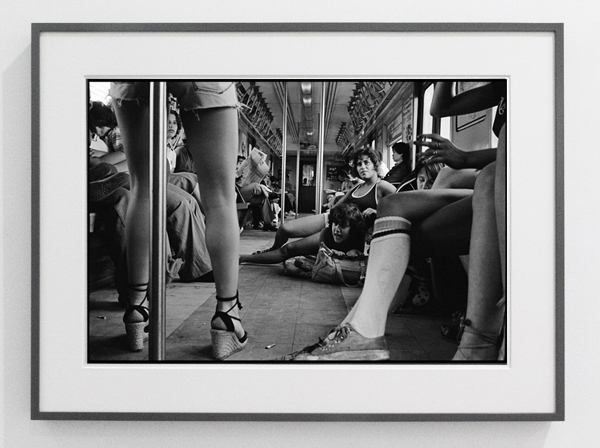 “Prince Street Girls, 1976-1979” is a captivating series of black-and-white photographs featuring a small group of tough, adventurous, and archetypally bored girls who hung out on the streets of New York’s Little Italy in the nineteen-seventies, near the photographer’s loft. Meiselas was an outsider, an artist taking advantage of cheap downtown space, and her unconventional life won her the girls’ fascination and friendship. With their feathered haircuts and adult poses—whether in school uniforms or in halter tops and denim shorts—Meiselas’s subjects represent a distinct era of unsupervised childhood in an ungentrified city. These kids rode graffiti-covered subways to the beach, and smoked cigarettes while perched on car hoods. Camaraderie, competition, and protectiveness are all palpable in their body language in candid pictures that also convey vulnerability—and a faith that there’s some safety in numbers.